Hi Everyone and thank you for the welcome. 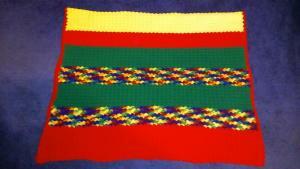 Brenda, I love the afghans and that pot holder is one of my favorites. I am working on a dress made with thread for an 18" doll that looks like the outfit worn in Wizard of Oz by Dorothy. 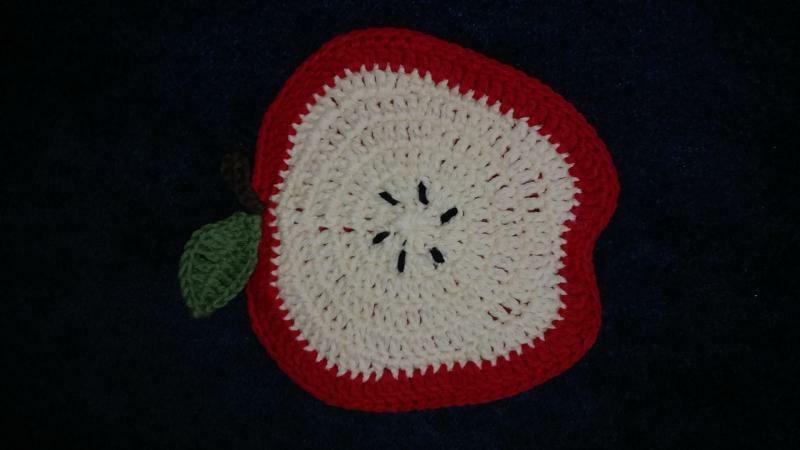 With the heat and humidity working anything large with yarn is out for a while. You will have to excuse me as I learn how things work here. I am happy to hear the grocery store is going to open soon. Let's see I made more bread, did a lot of cooking. Today will consist of baking the bread, make crock pot spaghetti and corn on the cob grilled. Helping the boys study for EOG's. Then will Take them back. Welcome Tampa Doll. Love to see you here with us all. 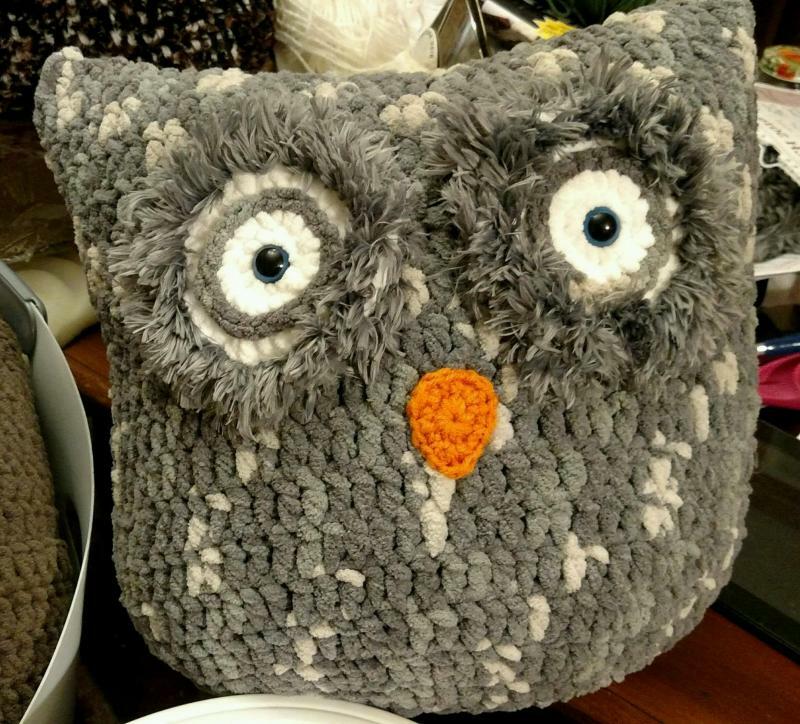 I have made 6 of these owl pillows. All different colors. what oretty blankees Bgs snd such nice sizes too i am a sucker for brights but thart pretty pasrel one is calling my attention. NIe job! Sandra those are so cute! And all different too. I bet they were fun to make! MAry jo i envy your thead magic!! You always make such cute things. Yesterday while straightening up i cleaned up my pin cushion too tthey,look good and still like new!!! Hi all. Glad to see that eye candy!! nic eghans Bgs lovr them both and such nice sizes too! 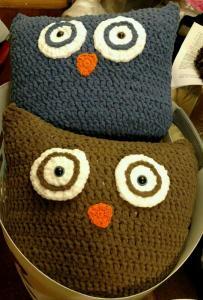 Love those pillows sandra they are so cute and all different too !! 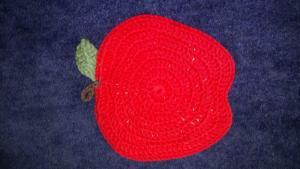 Love those applea. I used to make and sell them in a both i had in a craft store. I sold sets of four thr apple the lemon the orange and a slice of water melom including seeds lol they went fast. So did the red and white Go Big Red hats too could not keep up with those!! Well carol how is the mew granbaby!! I bet she is growing a bit huh. Hec yeah Linda that is good news!! I think it is Creative Creations isnt it..
Snowbear where are you lol show,yourself young lady! I miss yarnmonkey' and viking, and scrapper too but im sure when life slows down a bit we will hear From them again. CRchet fan how you doing? Wwho else havent i heard from recently. Well if you are one of them xo e on in and let us knoe how you are doing ok. Any new pics of the new babies would be welcome too. Well hope you have a Glorious day today!! Ill see you after while. I rhink son in law is coming to pick up my tower too sometime today as daughter has another work meetin early this eve. Talk to you all later. Oh my gosh. I have this show on about building homes in alaska. Well one couple did and it was lovely. The they got their first prophane heating bill for 45 dyays it 65,00 Dollars!!! they did an update and installed some solar panels at yet another Get this 89,000.00 that is 80 nine thousand dollars how and where do thes people get that kind of money. These are the rich and elite for sure!! THe panels helped as now their bill is about 450.00 a month. Sheesh un believable. Owlvamp cute pillows and the fresh bread and spaghetti would smell and taste so good. Mary Jo you make some of cutest doll clothes and the thread ones always look elegant. Know what you mean by wanting smaller projects as I was getting too hot working on the bright afghan. 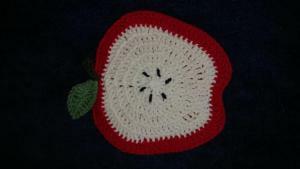 pineknott maybe our sunny day will make it to you in a day ot two.I think grannyannie's charity is compassionate creations which reminds me wonder how she's doing. yarn_monkey long time no see Peanut here. They grow up so fast the next thing you know he will be graduating from high school. katy I had heard a few years ago that some schools had quit teaching cursive and then that some started teaching it again. I would think that practicing it would help with hand eye coordination and exercise the brain a bit along with learning how to be disciplined in doing things you probably dont want to do. I always did better at remembering and learning in school by taking notes---writing it down. To this day if I want to remember something its best that I hand write it. I may forget to grab my grocery list but I find I can remember what was on it because I wrote it down. Gosh that is one heck of a gas bill. At least it looks like the solar panels even though expensive are going to really pay off in just a couple of years. Sunny day here and starting to get hot out. We spent a few hours this morning with the push mowers. I need to spend a couple hours mowing each day this week but its supposed to rain a lot. I like to keep as much mowed as possible as we get fewer ticks and I am more likely to see the snakes before stepping on one. I really miss my lawn tractor with the 54 inch mowing deck. Hope its number for getting worked on comes up sooner than estimated. Now I am chilling out at the Genealogy Library. Dh does research and I sit in the huge snack area looking out the windows at the golf course drinking a diet coke and crocheting. Its a beautiful building with lots of windows and big open areas with nice tables to work at. It originally started in the basement of of one branch of a local library system. I have to put the dress aside to do the tote. I was checking and Stephanie has not been on since January. Everyone has been busy and doing lots of stuff. I saw that show and we were just watching one with a couple in Chicago looking for a house and their budget was up to $700,000. I do laugh when they go into places like Philly and such and these people look at Townhomes for like 300-400 thousand. We grew up in them and at that time they were called Row Homes and they were bought by our parents for about $15,000. I shake my head and laugh when they say how cute and quaint they are. Computer getting turned off, hockey game on. Ah good for you and i hope the mower gets fixed soon its hard work mowing so much and so lomg. I would cut it into smaller pieces each day like you are doing a little each day. That is a good idea. We ll my baby has left she left in son in laws capable arms to get diagnosed so keep your finger crossed that she is not terminal and comes home in good computer health lol. I tol hiim To be gentle she is not used to anyone but me using her lol. He said it could. Be as simple as a bad cable or as bad as a mother bord. Im still thinking a video board or card whatever one she has. SO I am off for the night an i have enough leftover meat loaf for a sandwich or two for lunch tomorrow too! Handy man made a big one! That is about all my news for tonight. Hope ever one is ready for Monday tomorrow cause its creeping up on us i'm afraid!! Oh i know. We got the peppers and matos in yesterday so that is done. Its all we really plant cause its all we really like and or have room for loll So a light rain would help around here, just not a gully washer is all. See ys later!! enjoy your evening! Yes i knew it had been a while for sopo i know they had so many bad storms in OK so i hope she is ok thanks for checking. Wow January huh well all mail at yiour own risk i have nothing current on her i am sorry to say. Just her last known-and not sure how current that is. SOpo if you are out there come and see us! MAryJo I just shake my head maybe in the next lifetime i will live in the lap of luxury huh lol but for the here and nowi i am just pretty grateful to have what i do have you know. Stephanie's dad's health was declining when she went mia so she may have her hands full there. I know she has been through some dark times and this wasnt going to help. I am going to make her a square and send her birthday card in a couple of weeks so maybe she will check in. I must have got in the wrong line somewhere along the way as $700,000 is way out of my budget for a house. katy besides being a lot to mow it is rough terrain and a hillside so its not at all like mowing a city yard. Hope your computer isnt terminal and its an easy inexpensive fix. Grocery store is open!!!! I know its silly but I wandered up and down the aisles marveling at the stocked shelves. Welcome to the group, Tampadoll! I have been wiped from doing so much work inside and outside. My kitty is on meds. now so at some point I will have to run out and pick the pills up. I just need to get motivated. Good Morning everyone. Game turned out good, even though I feel asleep thru most of it. I have my yarn ready and as soon as our friend comes to work outside, I will get started on the tote. owlvamp, I meant to tell you how cute those owl pillows were. I have to change the color I am using for the dress, as they used America's Best thread in sky blue. It is a combo of baby blue and white. It is not available anymore, so I will probably go with baby blue. I am up and easy to attack the day. Shoulder is acting up and hope it gets better. 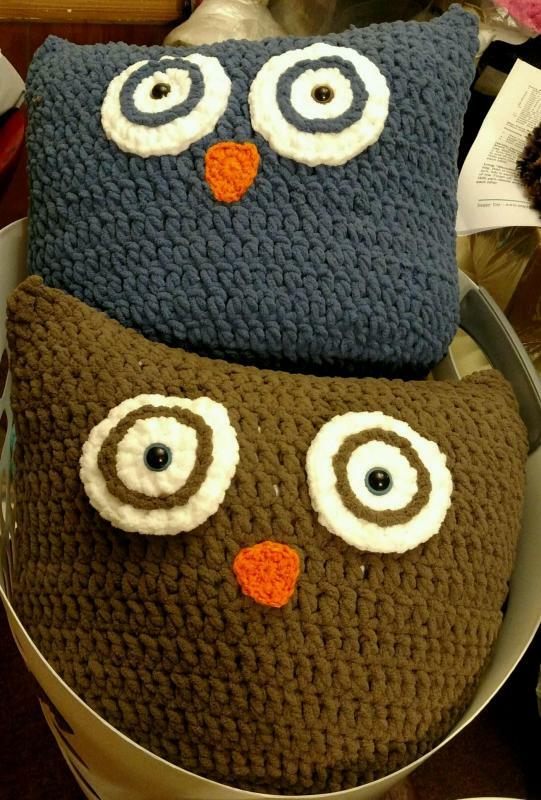 Thank you for the nice words about my Owl pillows. I have 6 more to finish the eyes and beak on. Then will put some fun fur yarn or fur on them. I want them all to be different . I designed a smaller one too. Off to take shower and get started on the day and wait for little man to come. 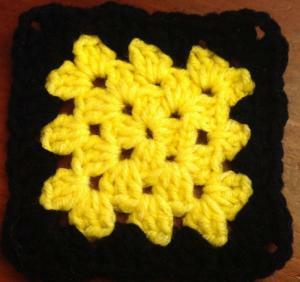 Received 6 yellow squares in the mail. Thank you Cshort! Numbers are coming down. I'm so excited. Can't wait for this project to be over with. 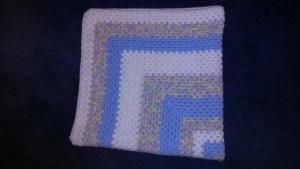 I am a little slow to this, what size squares are these and is there a certain color blue you want? Yes, Tampa Doll. Three rows of Blue then one row of black . When done it should measure around 5 inches. I believe most are accomplishing this with an H hook. Here's a picture of the one cshort just sent in.